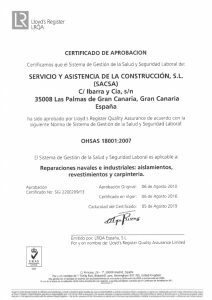 SACSA is the continuation of a family business established in Gran Canaria in 1982 by Ignacio de la Mora, a young entrepreneur who worked at Santander in the naval sector. Being in Nantes (France) he learned about the use of polyester and polyurethane. After working a few years in Galicia, he returned to Santander. 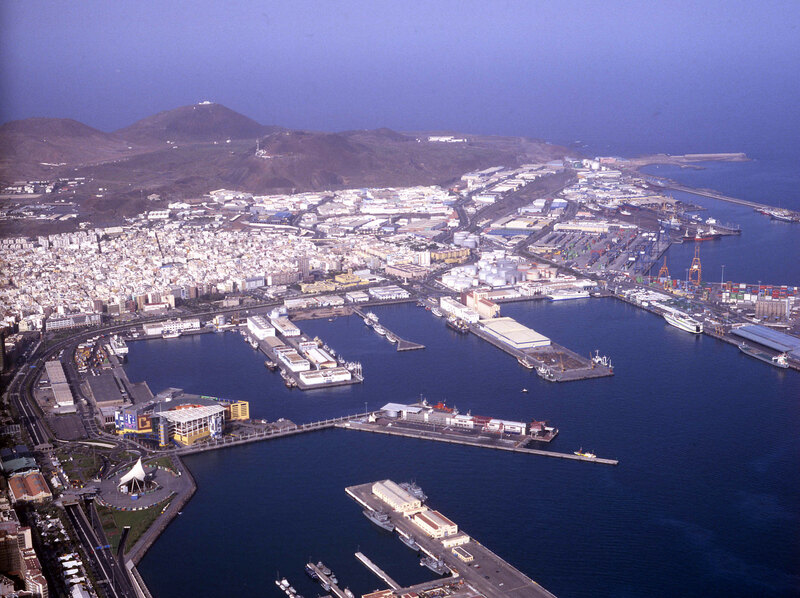 In 1973 he take the challenge of manage the company ISOCEL in Las Palmas de Gran Canaria. He start being the first to use polyester and polyurethane to carry out the isolation of ships coming into port. SACSA was founded in 1982, which implements all their knowledge and specializes in offering isolation and naval carpentry, becoming a leading and prestigious company. For more than 30 years, our mission has always been to meet the needs of our customers. 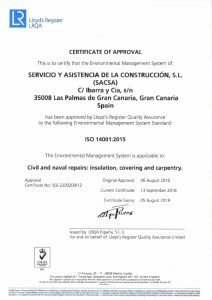 SACSA es la continuación de una empresa familiar establecida en Gran Canaria en 1982 por Ignacio de la Mora, un joven emprendedor que trabajaba en Santander en el sector naval, viaja a Nantes (Francia) y es allí donde conoce el uso del POLIÉSTER y el POLIURETANO. Después de trabajar unos años en Galicia, regresa a Santander, donde recibe una llamada de una empresa gallega y le proponen, en 1973, llevar la dirección de la empresa ISOCEL en Las Palmas de Gran Canaria. Acepta el reto y comienza a ser el primero en utilizar el poliéster y poliuretano para poder llevar a cabo el aislamiento de los barcos que llegaban a puerto. En 1982 funda SACSA, en la que pone en práctica todos sus conocimientos y se especializa en ofrecer servicios de aislamiento y carpintería naval, convirtiéndose en una empresa líder y de prestigio. Durante más de 30 años nuestra misión ha sido siempre satisfacer las necesidades de nuestros clientes. It is proven that only companies that adapt to changes in the environment and in the family achieve the dream of all family owned business. And for this one must value the contributions of different generations. And these different generations must communicate, understand, support and add. The sum of traditional values ​​and innovation is what makes strong family businesses and SACSA NAVAL is a clear example. In SACSA NAVAL we know that trust is a core value and a cornerstone to establish links with businesses and long-term customers. Because trust is intimately bound to fidelity. Without trust there is no possibility of faithfulness or loyalty. Would you trust someone who changes his mind all the time and that does not meet their commitments? We do not. The CULTURE OF EFFORT is the only way to develop talent to be competitive. Proof of this is the projection of SACSA NAVAL in naval market. Committed to continue on the path of innovation, personalized dedication to each customer and control of the highest quality in every product. Industrial development and technological innovation are clear elements in the strategy of SACSA NAVAL. Thanks to continuous innovation efforts are achieved and meet the needs in new markets and industries. Contribute to the development and implementation of these business values ​​and also their employees personally and professionally, resulting in the opening of new markets industrial character. Assure our customers excellent quality is definitely our priority. 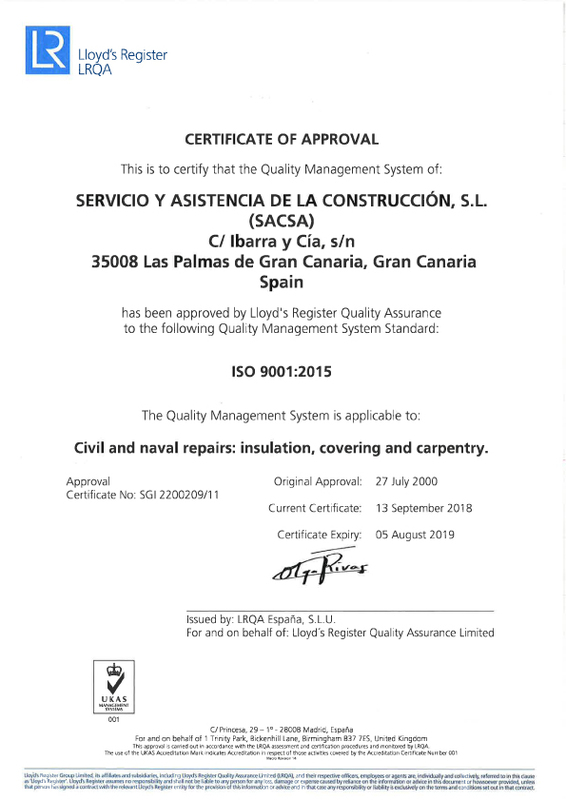 It is for this reason that in 2000 and based on our commitment to continuous improvement implemented a management system ISO 9001: 2000 is applicable to naval and industrial repairs, insulation, coatings and carpentry. 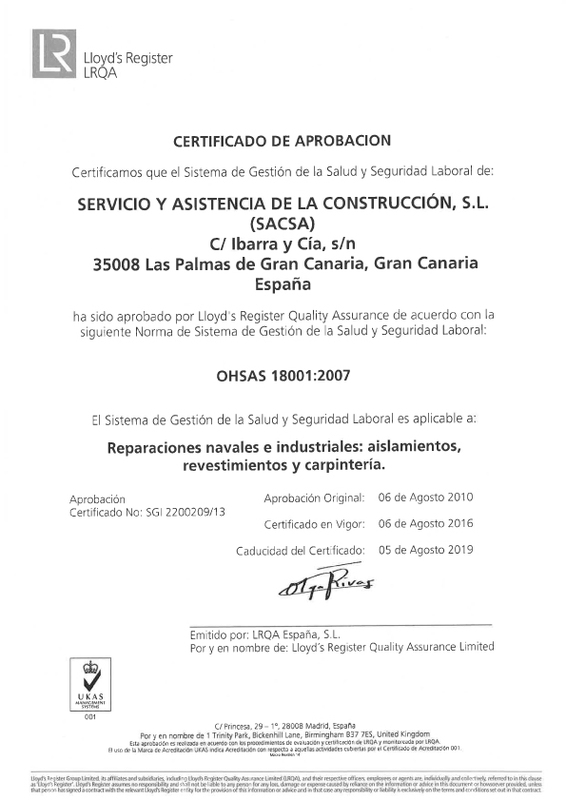 We are constantly growing, adapting to the most demanding quality standards internationally. Safety and health of our employees is a priority for SACSA. OSHAS helps us to respect the safety standard at work, as well as help to inform and prepare our staff to be able to carry out the work in a safe and responsible manner. In SACSA we are committed to provide a safe and healthy environment work, putting all our resources to that idea. We strive for excellence in health and safety every day through commitment to leadership and communication systems. 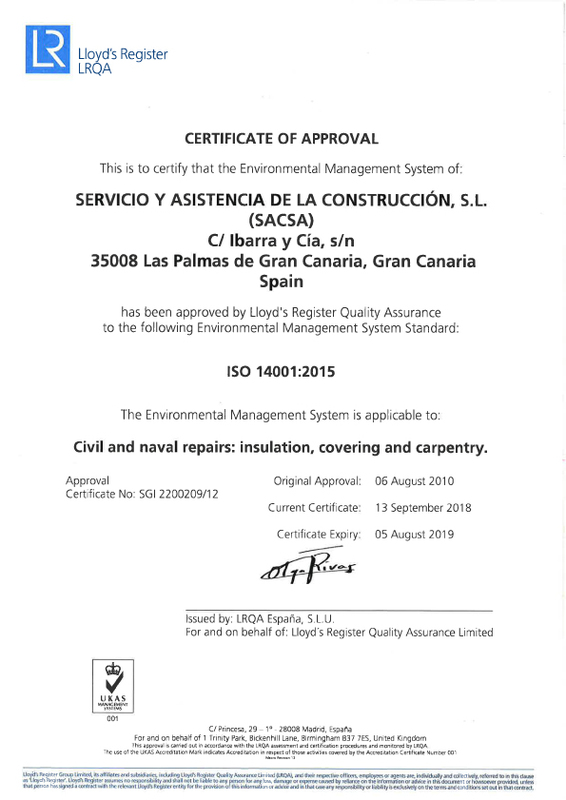 All our work is done in compliance with specific regulatory and industry requirements and application to issues of health and safety, and we ensure that the risks of health and safety arising from work activities are identified and adequately controlled in all moment. The various services provided by SACSA set out in the following sectors: naval, offshore and industrial. Each sector has specific conditions that SACSA, with more than 30 years of experience, knows perfectly and we adapt to each client. Whether a small repair or a large project, SACSA always perform the work safely and within the estimated time, we know that time is a factor of great importance and therefore we are always prepared to meet the needs of our customers immediately. In SACSA we have a large stock of materials with MED certificate that allows us to provide an immediate solution to our customers. SACSA counts with staff trained for work aboard oil rigs. We also have all the legal elements necessary to perform work during navigation. De acuerdo con lo establecido por la Ley Orgánica 15/1999, le informamos que los datos obtenidos de este formulario serán incorporados a un fichero automatizado bajo la responsabilidad de SACSA S.L. con la finalidad de atender sus consultas y remitirle información relacionada que pueda ser de su interés. 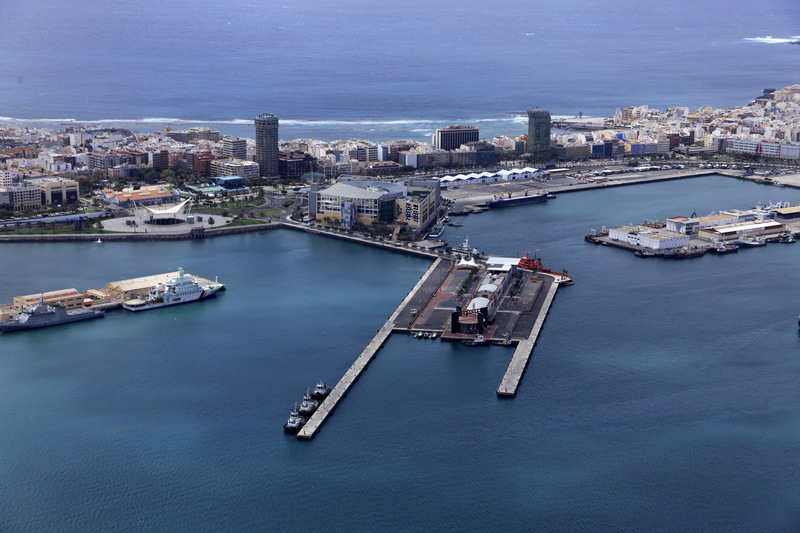 Puede ejercer sus derechos de acceso, rectificación, cancelación y oposición mediante un escrito a nuestra dirección IBARRA Y CIA S/N 35008, LAS PALMAS DE GRAN CANARIA, (LAS PALMAS).